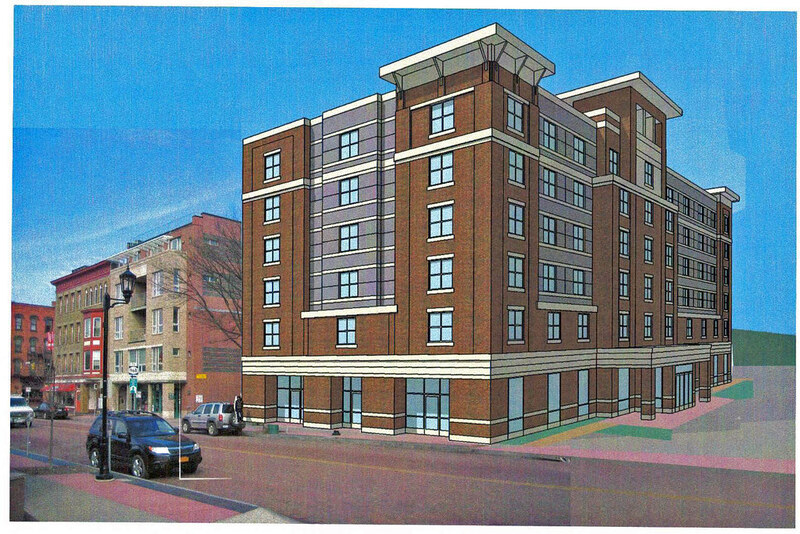 At its meeting December 20, the Ithaca Urban Renewal Agency unanimously approved the designation of Lighthouse Hotel, LLC as “a qualified and eligible sponsor” for acquiring properties at 320-324 East Martin Luther King Jr./East State Street through a negotiated sale for the purpose of an urban renewal project. 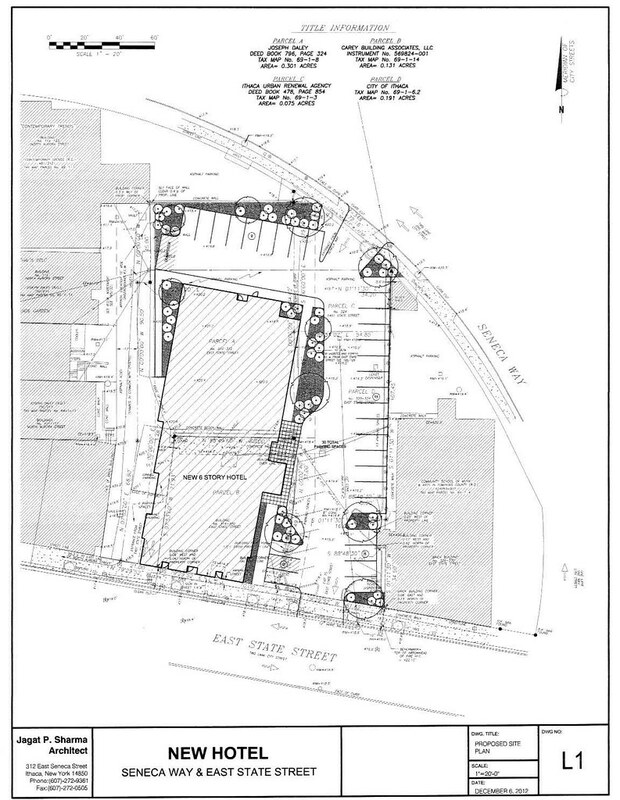 The proposal by Lighthouse Hotel is to develop a $16 million, six-story Hampton Inn & Suites with 92 rooms. The project site would cover four parcels including parking lots owned by the city and the IURA, the Carey Building and 310-312 E. MLK Jr./E. State Street. Of the four parcels, two have been parking lots for a long time, and I would not be surprised to see a garage of some sort would be a component of this project (probably above ground, given the water table…otherwise, there is a rather underutilized garage a few blocks south, if the city presses them enough and the developers are willing to play along). Then there’s the Carey Building. The Carey Building is a two-story structure built in 1922 and named for its developer, broker Henry A. Carey. The building, with its Egyptian Art Deco accents, was designed to match the Strand Theatre to its west. The Strand Theatre, or what was the Strand, comprises the last parcel. The theatre was built in 1917, closed in 1975, and although attempts were made to save the building, it was torn down in 1993, a victim of poor maintenance. As seen in the aerial, the site is now a parking lot. For practical purposes, the Carey Building is in good structural shape, and is maintained by the locally prominent Travis Hyde properties. The Eagles Building on the SE corner is not a part of the project. Now, I tend to not be a big fan of Hampton Inns, a middle-rung hotel chain infamous for half-assed design on the cheap. Although a slight improvement over the years, most Hamptons built in the past decade could be described as beige boxes with oversized pillasters and raised parapets. One only has to look towards big-box land for an example – The Hampton Inn “designed” by Sharma Architecture and built in 2003. Chain hotels are often the architectural equivalent of “fill-in-the-blank”, and as cheaply as possible. Still, one can hope – the average Hampton cost $6-8 million (~$60,000/room) to develop in the mid 2000s, and the budget for this project is $16 million. Hopefully, some of that will go towards something fitting for the city of gorges. In my mind’s eye, it has a more unique look, subtle or off-site parking, and incorporates the Carey Building, or at the very least its street-facing facade. So in sum, any proposed demolition of the Carey Building might cause a lot of problems for the developer. The IURA’s decision a couple days ago only makes the developer a qualified buyer for the IURA parcel, and does not guarantee any development. And I’m sure there will be many, many meetings ahead for this one before any approvals are granted. So much for preserving the Carey Building and subtle parking. So, I wish I had had more time to put some thought into an entry. But an unusual event took place in the past few weeks. After a series of phone interviews, I was flown out to California for a meet-and-greet/any final interview details for the research lab of a defense contractor. And up to my arrival, I was 99% sure I was going to accept the offer. It was a step up in my field, and the pay was also a nice boost. Then I got out there, and they showed me the projects I’d be working on. Oddly enough, in all of those phone interviews, so much time had been spent asking me questions and going over my background that we had maybe discussed the projects for a few minutes. As they’re showing me the work, a know settled in my stomach – I’ve done this work before. I only did it before because I had to and it paid my bills. Luckily, and unluckily, I left with a verbal offer, and the paperwork to arrive in my email that Monday. So on the sleepless flights back to NY, which thanks to a mechanical failure took 27 hours, I went through a career crisis. I could continue at my current work, which had some rewards but wasn’t doing any big favors for my career or pocketbook; or I could accept the lucrative job out west, which strayed even further from my interests. In the end, I decided to stay. I’m optimistic other opportunities will come up if I keep searching. And hopefully, one of those will elicit a feeling of excitement when I see the work involvement, rather than a feeling of dread. I managed to step out of the situation with enough grace that I was able to set up a colleague with an interview for the position I passed up, so hopefully there’s some good karma in that. Anyway, since my time has been tight, the tried-and-true keyword bar entries come in handy, where I look at the search bar to see if there anything worth a little more discussion. From my recollection as a recent alum, the answer is generally no, but some a bit more fraternal than others. Some had a personality that was more similar to a small dorm, where members only moved in because it was cheaper or they were going abroad for a semester, and there was little in the way of camraderie; others did parties and tended to keep members over multiple years (thinking of one instance of a costume party at Von Cramm where the only thing one girl was wearing was paint). I remember that Whitby, Von Cramm and Watermargin tended to be a bit close-knit when I was a student, but I think two years is enough to make my conceptions fairly outdated. Gamma Alpha is a professional society for graduate students pursuing scientific disciplines. It’s not officially recognized by the university, but they continue to maintain a presence on the edge of the gorge at 116 Oak Avenue. According to a 1965 Sun article, their initiation is “something like 2 minutes“, and they have few fraternal activities. So it’s one of those unusual organizations that straddles the functions of a fraternity and a co-op. The original Sphinx Head tomb, at 900 Stewart Avenue, served as their windowless meeting chamber from 1926 to about 1969, when it was sold to a professor who owned the adjacent property. The next buyer built a house on the property in the style of the tomb, and from here, Carl Sagan purchased the house. So Carl Sagan lives on the site of the tomb, but he did not live in the tomb. It has been rumored that contemporary Sphinx Head constituents meet in a room within Sage Hall. The Argos Inn is a small boutique hotel that recently opened on the east end of downtown. The building it inhabits (known as the Cowdry House) has a long and storied history – built in the 1780s, and used as a home of Ithaca’s political elite, the building was home to the world headquarters of Duncan Hines in the 1950s, and the Unity House nonprofit prior to its conversion to a small hotel. I hear it has a nice bar. In almost every circumstance I can imagine, the answer would be engineering. The gap widens if you’re an in-state resident, thanks to the ag school’s contract college status, versus the engineering school’s endowed status. But the two are different enough that they compete for different students usually. Some programs, like Biological/Environmental Engineering, may start off with students in CALS that transition into the engineering school. Others, like Atmospheric Science, allow majors from both schools, and have some general coursework in the engineering school. But otherwise, the interests of a CALS candidate and an Engineering candidate differ widely. Officially, the Events Center is the tallest at the school and in the county, at 174 feet. It still surprises me just how prominent Collegetown Terrace is from some parts of the city. It truly is a massive project for a city of Ithaca’s size. It looks like the first floor of concrete has been poured for Breckinridge Place. The project seeks completion in fall 2013. Renovation is just as important as new construction. One of the INHS new builds. Sometimes, they renovate. Other times, when the house is too far gone, or has been severely compromised from a historical perspective, then a tear-down may commence. This duplex is an example of the latter. The Iacovelli apartment project on West Seneca is topped out, with initial facade work complete on the faux dormers, and windows recently installed. I had expected external work to have begun for the new hotel tower for the Holiday Inn, but it appears this is not the case. I was wondering if it was interior asbestos removal, but the low-rise portion slated to be demolished looks to be fully occupied. I am honestly unsure what the time frame for initial site prep is. Likewise, the Ithaca Marriott / Hotel Ithaca site isn’t fenced off yet, so this will probably see a late winter/ early spring construction start. A row of homes, all set to be demolished. Two are for Planned Parenthood’s new building, but I’m unsure the reason for tearing down the other two. Parking? The new Fairfield Inn down in big box land. Framing is underway, so completion in six to eight months is feasible. Cayuga Place, with only vestigial site prep at best. This one probably won’t start until the Spring anyway. Finally, something that is well underway. Asbestos removal and demolition of the former Challenge Indsutries buildings to make way for the new Seneca Way apartment building. Site of what could be the future Harold Square. The Home Dairy and Benchwarmers buildings (the Sage Block and Miller Block, I think offhand) would be renovated, while the three smaller buildings at right would see the wrecking ball. It’s hard to imagine an 11-story building standing in the background.